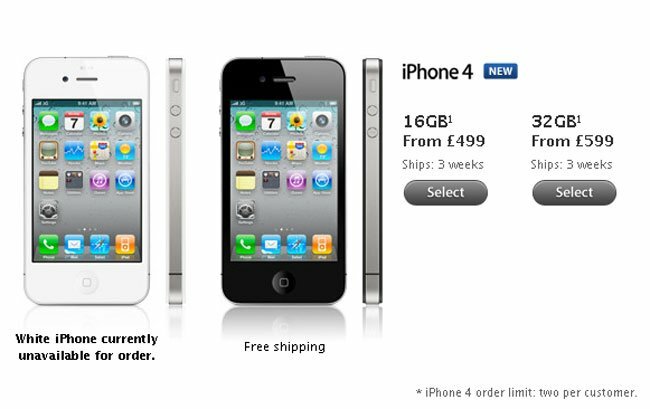 If you have been waiting to get your hands on one of the new Apple [AAPL] iPhone 4’s here in the UK, you may have a bit longer to wait as Apple has changed the shipping date to three weeks on its online store.. This means that anyone ordering an iPhone 4 from the Apple store online, here in the UK will have to wait at least three weeks, as the shortage continues here in the UK. Apple has put the iPhone 4 shortage down to the huge demand for their new handset, yesterday we reported hat Apple sold a massive 1.7 million iPhone 4’s from launch day on Thursday 24th of June until Saturday 26th of June. If you have managed to get your hands on a new iPhone 4 from an Apple store here in the UK or anywhere else recently let us know in the comments below.